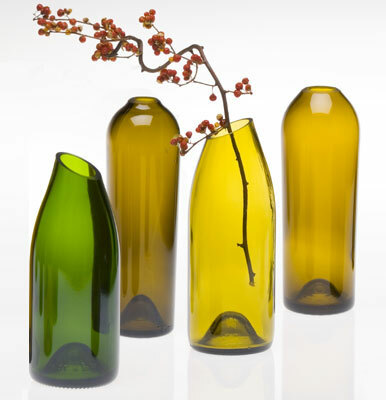 I've seen lots of lovely terrariums made in bottles which have had the necks cut out in stylish ways. How hard is this to do at home? I've found a set of instructions at Natural Home and Garden by Dani Hurst that doesn't look too difficult. Has anyone tried this before? Can you share any tips or warnings? It's pretty easy to cut them. The hard part is how to sand the edge after it's apart. I've never found an easy way to do it. I'd like to know how they cut the bottles in the picture above. I bet the ones pictured above were done with a machine or something! The edges look too nice to have been sanded.